Changing chords is pretty hard, and is one of the things that puts people off of playing guitar past their first few lessons. It’s true that you’ve got to put the time in, but there is something we can do to make things easier. In this video is all the basic theory you’ll need to understand why chords work and sound as they do. I’m focusing on guitar, but the theory remains the same for all instruments. Learn and enjoy. A Chord, by definition is a collection of several different notes played simultaneously. 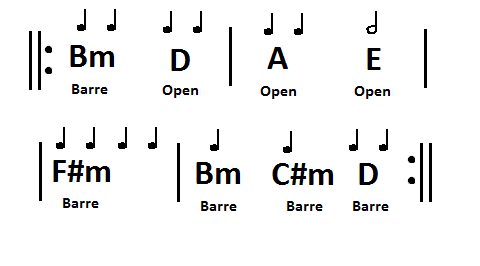 Open chords are ones which use an instrument’s open strings. 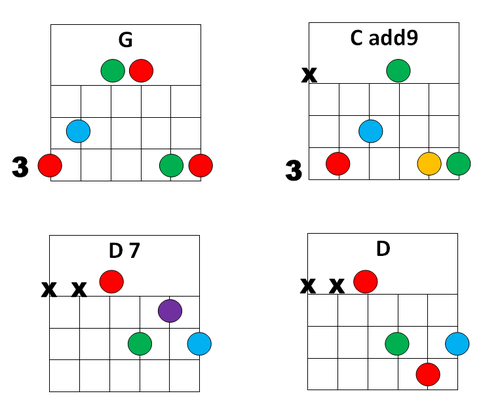 Below are diagrams for the 8 most common open chords to get you started. A Suspended Chord is one in which all 3rds are replaced with either 2nds or 4ths. Losing the 3rd can make a chord sound very vague or open, but the addition of the 2nd or 4th will certainly make up for that loss of character. 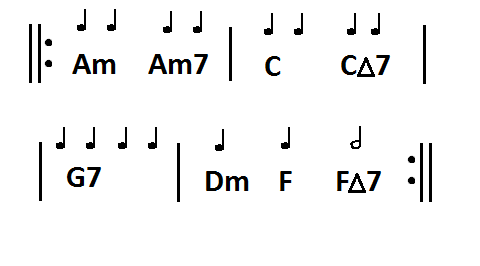 Despite losing a note from our Maj or Min triad these still qualify as chords because of the additional 2nd or 4th. Remember, a chord is a collection of any three different notes, usually these happen to be a triad, but not always. It’s quite common to set-up chords in longer sequences. This is usually done by playing either the root note of the chord to come, or it’s 7th, within a preceding chord. Sus chords can allow us to do this. If you’re spending a lot of time on one chord, you could vamp a little, or play a short melody using the 2nd, 3rd and 4th whilst still playing the rest of the chord. Sus chords can also be a neat alternative to Extended Chords when you’re looking to create a chord sequence with common tones, or maybe just something a little different. If a minor chord sounds too dark, or a major chord too bright, then try replacing them with a Sus Chord. Below are some of the easiest Sus chords to play in the open position, along with Barre Chord diagrams for roots on the E and A strings. In these charts Sus2’s are coloured Orange, while Sus4’s are Yellow. Hammer-claw finger-picking is a technique used in country, jazz and sometimes blues music where the guitarist plays with their fingers rather than a pick. In this style your thumb is the “hammer” and your fingers are the “claw”. Your “hammer” is intended to play the bass strings, (E, A and sometimes D), and replicate the job of a bass guitar, while your “claw” plays the chords on the higher strings. The really cool thing about this technique is it can replicate more than one instrument, which can thicken-out a solo performance remarkably. 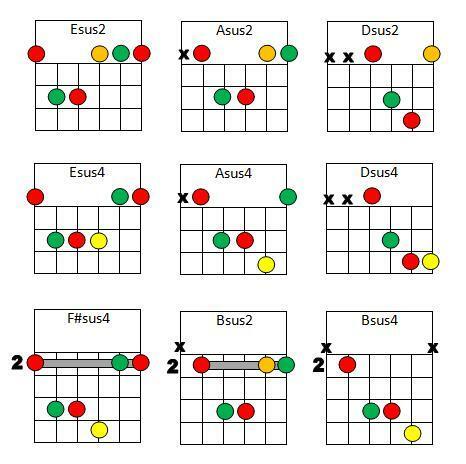 Below are the charts for the 4 chords you’ll need. Although other notes are used between these chords, these are the shapes you’ll be holding down the majority of the time. 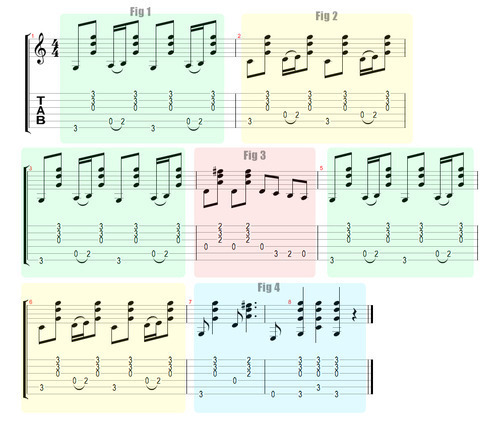 Here is the tab and notation, broken up into each figure as discussed in the video. This track is intended as an exercise for students who have recently been introduced to 7 Chords. Once they are familiar with the shapes this track is a good way of putting them into practice and using them between chords they’re already familiar with. You can review the Basic Open Chords and Open 7 Chords lessons to remind yourself of the chord shapes. The cool thing about the first 2 bars is that you only change one finger between every chord. This can also be used as a backing track for solo guitarists. The key CMaj / Am. This track is intended as an exercise for students who have recently been introduced to Barre Chords. Once they are familiar with the shapes this track is a good way of learning how Barre chords can be used in a song. Students will be playing Barre Chords along with the Open Chords they’re already familiar with. You can remind yourselves of the chord shapes by referring to the Basic Open Chord and the first Basic Barre Chords lessons. It can also be used as a backing track for solo guitarists. The key is F#m.